A few weeks ago I got very excited about the arrival of some books about books. The one I decided to read on and off first was ‘Stop What You’re Doing and Read This!’ The idea behind the initiative of this book from Vintage is to remind people about the joy of books and to have them running out to read more. I had hoped to pop thoughts on this up on World Book Day yesterday however I was so conflicted by it I needed to mull it further. ‘Stop What You’re Doing And Read This!’ is a collection composed of ten essays by authors (such as Blake Morrison, Zadie Smith, Jeanette Winterson, Mark Haddon etc) as well as people in the industry such as Virago founder and Man Booker judge Carmen Callil and Jane Davis, who is the founder and director of The Reader Organisation which this book is supporting, discussing the importance of reading and the joy that books can bring in their many forms. The collection starts with Zadie Smith’s ‘Library Life’ which shows the importance of books and libraries in particular to her shaping as a writer and finding books and also as spaces for her to do her writing. It is an impassioned and political essay which looks at how the people making the decisions about libraries are probably the ones with enough income to have their own personal libraries and so may not be the best people to leave in charge of such issues. Blake Morrison, who I have never read before but now most definitely will be, follows with the superb ‘Twelve Thoughts About Reading’ which had me going ‘yes, that’s me, yes, that’s me again’. A book like ‘Stop What You’re Doing and Read This!’ could have one slight flaw to it and become worthy or preachy. Fortunately there was only one essay in the collection that, to me, jarred and that was Tim Parks, unfortunately it jarred and lingered. I don’t know Tim Parks, I have not read any of his books, but for me his ‘Mindful Reading’ came across as a little bit pompous and clever, in fact it read rather like a high brow person (who knows it and loves it) feeling like he was writing for low brow about how clever we readers are and therefore, not so cleverly, excluding the reader completely. I didn’t like it, and this broke the spell and made me suddenly ask the question ‘if I wasn’t a lover of books would this book make me rush out and read more?’ and I kept asking this as I read on and it left me in a real quandary. I am a book lover as it is, so naturally I would enjoy this book as would any book lover the world over, but is this going to be taken on board by the people it’s aimed at, which technically isn’t me because I am an avid reader, I was not convinced. From this point on I doubly assessed each following essay and ones that proceeded it, well apart from Mark Haddon’s incredible essay ‘The Right Words in the Right Order’ but more on that shortly. I looked back at Carmen Callil’s essay and found myself thinking ‘I know who she is because I love books, would anyone who didn’t love literature know who she was and would her essay therefore work as well?’ As someone who isn’t a fan of poetry I thought Jane Davis’ essay on the power of it (and indeed reading aloud and why she started The Reader Organisation) was incredible and very moving. There were a couple of lines that almost went into a rather worthy and preachy mode; I put this down to simply her passion, would anyone else who happened upon this book feel the same or would they think ‘who does she think she is?’ With Michael Rosen’s ‘Memories and Expectations’ I found the book lover in me thinking ‘wow, this has made me want to run out and grab Great Expectations right now’ because of Rosen’s poignant memories of storytelling, but also thinking ‘this is a wonderful piece of writing but is it only going to appeal to readers of The Guardian, myself included, rather than the layman who doesn’t read?’ I feel bad writing that, because I enjoyed the book so much personally, but once that one essay made me question the whole collection that question wouldn’t leave. Three essays in the second half (along with the wonder of Blake Morrison’s essay earlier on) almost erased it however. Nicholas Carr’s ‘The Dreams of Readers’ is a wonderful essay on how no matter what technology comes next nothing will ever beat the novel, he won extra brownie points from me when I found out he writes about technology, it almost doubled the power of the point he was trying to get across. Jeanette Winterson’s ‘A Bed. A Book. A Mountain.’ is a wonderful piece on where a story can take you and the thrills and experience it can bring from wherever you are. The essay that steals the show though has to be Mark Haddon’s ‘The Right Words in the Right Order’ I don’t care if you love books or loathe them, read this and you’ll be converted or simply love books even more than you thought naturally possible. It is brimming with wonderful ideas about reading and books and I loved it. I was going to quote lots from it but frankly you should buy the book for yourself and everyone you know simply for this one essay. A rather rambling and conflicted set of thoughts on ‘Stop What You’re Doing And Read This!’ overall. As a book lover and on a personal level this was a sublime read in many ways, but I am left with that questions of ‘am I the audience this book should be hitting’ and ‘if I was to give this book to a non-reader would they become converted’ and I am left unsure. If you read this blog I know you love books and so will, if you haven’t already, be off to get this book swiftly (and quite right too as it supports a great cause). Yet what about all those people who don’t read the broadsheets or blogs or who might not see this on a shelf in Waterstones though? It is something I can’t really answer. 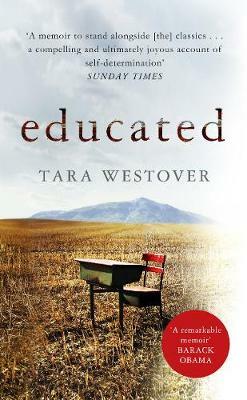 Who else has read this and what did you think both as a book lover yourself and then coming from the perspective of someone who doesn’t normally read books? Am I being too critical, is the question of audience with a book like this really relevant? I would be interested to hear other people’s thoughts on this. I am also wondering how I can get involved in The Reader Organisation too; mind you after this review they might not want me – oops. I am coming from a good place with my thoughts though I hope. 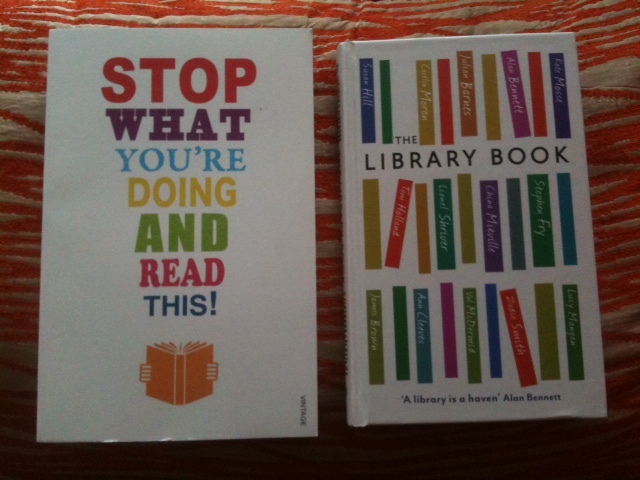 ‘Stop What You’re Doing And Read This!’ and ‘The Library Book’ are two books from separate British publishers which are all about books, reading and libraries. Really that should be enough to have you rushing to your nearest bookshop or book selling website shouldn’t it, in fact it might already have done just that, however I thought I would tell you a little more about both – just to really push you over the edge. ‘Stop What You Are Doing And Read This!’ is an anthology which asks the question ‘why should you stop what you are doing and read a book?’ The ten essay responses collected here are from the likes of authors such as Jeanette Winterson, Blake Morrison, Mark Haddon and Zadie Smith, along with Jane Davis founder of ‘The Reader Organisation’ and Carmen Callil who founded Virago and rather famously quit the International Man Booker judging panel. These ten essays simply tell you, in varying ways, the power of the book and the joys of reading. I have only dipped in and out of a few so far but from what I have seen it’s only going to make my love of reading and desire to read all the stronger. I know that Simon T of Stuck in a Book loves this book. There is a different twist on the joys of reading with ‘The Library Book’ as this book is of course celebrating the library itself. Some of my favourite authors like Susan Hill, Val McDermid and Alan Bennett (there are lots more Kate Mosse, Julian Barnes, China Mieville, Stephen Fry – I could go on, there are 23 pieces in this collection) have all contributed works to this book, not all of them are essays though as of course we go to libraries for fiction, and so some of the authors have made fictional shorts along with the other essays throughout – all about the library, of course. Again, I have only had a glimpse at this book (as it only arrived this morning) but I am very, very excited about what’s inside. In fact what am I doing here writing this? I should be reading them already! What I think is another thing that’s special about these books, if I haven’t sold these two you by now you may be a lost cause, is that they are working with the charity The Reading Agency (all the proceeds of ‘The Library Book’ are definitely going to this charity, it doesn’t say with ‘Stop What You’re Doing And Read This!’) which encourages people to read in all sorts of ways and is developing exciting library programmes. What could be better? I am hoping some of you have stopped reading the blog by now and run off to find out more, or even gone and got the book. I am off to sit with my copies for a while. I will report back, I hope you will too! I have been mulling this over for a while, yet it still might come out a little jumbled so bear with me. I was watching ‘The Café’ (a drama on the telly, but this post is about books) the other day and from about ten minutes in I knew I was going to love it. It’s situated in a café on a British seafront where the owner, her mother and her daughter (a jobless budding writer) spend most of their day chatting with its frequent customers. Sounds a bit non-descript so far but it’s honestly not. There’s a wonderful array of characters (a competitive old woman and a gay man who makes his living as a human statue are my favourites) a possible love story, but it’s the tone of the show that gets me the most. It’s in some parts utterly hilarious, in a gentle yet knowing way, and yet also in another moment quite heartbreaking – it is from some of the people behind The Royale Family so makes sense. I love the balance, which is pitch perfect in this case and am now desperate for books that match that balance of happy and sad in equal balance. I should state I don’t mean any melancholy books, I also don’t just mean hilarious books. You see after an episode of the café I am left feeling a little emotional (I haven’t cried yet, but I can’t promise I won’t) but generally extremely uplifted and happy (from all the giggling) and like I have actually been part of the place, emotions and lives these characters inhabit. I have been trying to think of examples and one, though it wasn’t quite perfect, was ‘A Spot of Bother’ by Mark Haddon (read pre-blog, its hard to imagine that time now). The last one I can recall doing just this was ‘When God Was A Rabbit’ by Sarah Winman which hit the exact note of making me laugh out loud before that heartbreaking sense in your gut from page to page, beautiful and spot on. I am sure there are others out there. I was tempted to say ‘One Day’ by David Nicholls (watch out for a Nicholls giveaway tomorrow) as it almost has that feel yet not quite. Maybe that’s because it is a love story (hence I haven’t mentioned ‘Bridget Jones Diary’ etc) rather than a family tale, and I am now thinking if a family at the heart of a happy-sad novel is what makes it work… Or maybe not? Maybe the atmosphere, tone, pitch and delivery have to be just right? Maybe it is just me and the mood I am in, maybe ‘happy-sad’ isn’t really a type of book, I think it is out there though, what say you? Anyway if you have any recommendations of these sorts of stories I would love to hear about them (and you could win such a book as part of the Savidge Reads advent calendar today too) as I would like a lot more of them to immerse myself in during 2012, suggestions anyone? 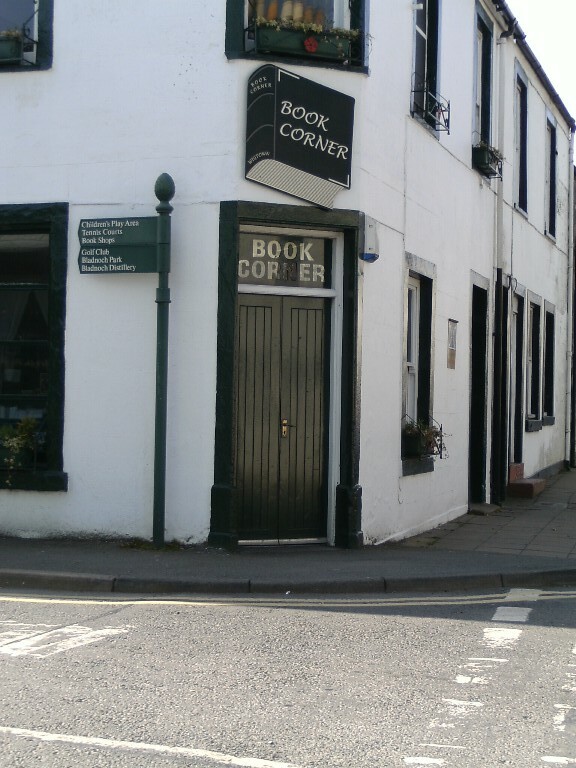 During the recent holidays, I went up to Scotland, and stayed in the county of Wigtownshire, which is home to Scotland’s national town of books, Wigtown. Throughout the course of the week, I had several opportunities to check out Wigtown, and take full advantage of the spending money I had to invest in a possible bulging carrier bag full of books. 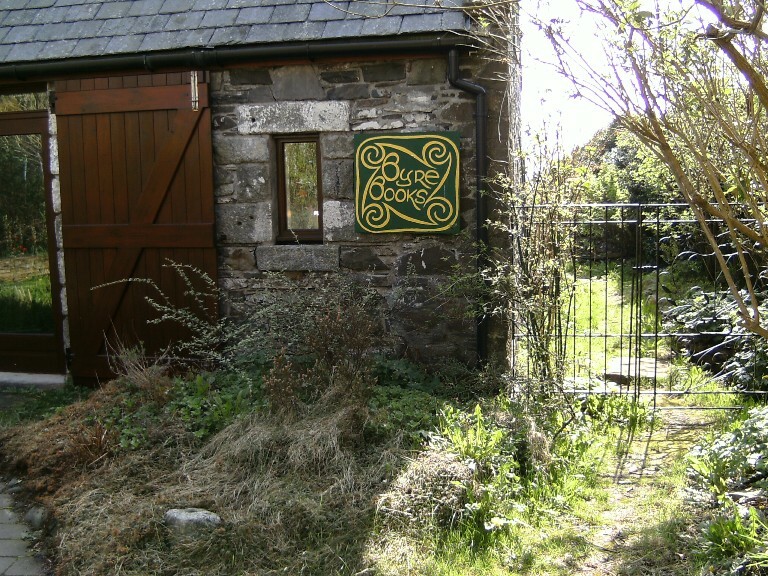 This bookshop was clearly a specialist bookshop, and you could tell just by walking through the door. It did have a quite big children’s section for a specialist bookshop, which was an added bonus. I managed to pick up a copy of Tanglewreck by Jeanette Winterson and Snake Dance by Anthony Horowitz, although they were £3.50 each, which was, I think, a bit of a rip off considering this was a second hand store! Reading Lasses was, as it said on the leaflet, a shop that specialises in books about and by women. It also said that it was the only specialist women’s bookshop in the UK, but to be honest it wasn’t up to much, and I didn’t buy anything! Byre Books, I’m afraid, also went down with a resounding no. The stock was out of date, even for a second hand book shop, and worse the woman there only answered our questions briefly, before her head swivelled back to her computer screen! 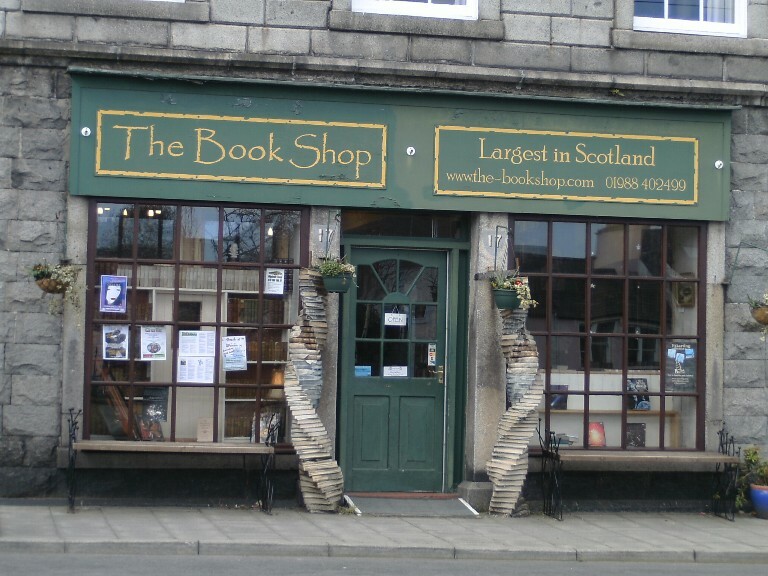 This bookshop, called ‘The Bookshop’ is the largest in Scotland, and boasts nine rooms, but the children’s section was, once again, well past it’s sell by date! Do bookshop owners not think children read books anymore I wondered? The Creaking Shelves Bookshop (which is Simon’s favourite name for a bookshop yet) was well organised, had new, just published, and in some cases, children’s books, but they were still charging full price for them, so I didn’t indulge! 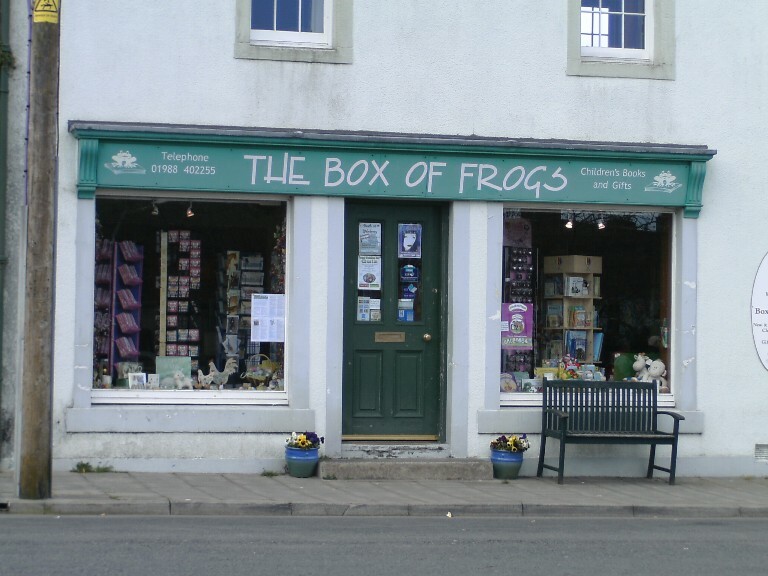 The Box of Frogs was by far the best for me, as it was a children’s specialist bookshop, and I picked up a couple of Alex Rider’s, including a signed copy of Eagle Strike for £2.50, Bargain Alert! I also picked up three old Doctor Who books for my friend, and as an added bonus the staff were lovely! In fact I was surprised overall just how unfriendly the staff were in a lot of these shops, you want friendly staff who want to help once you have meandered through all the shelves. 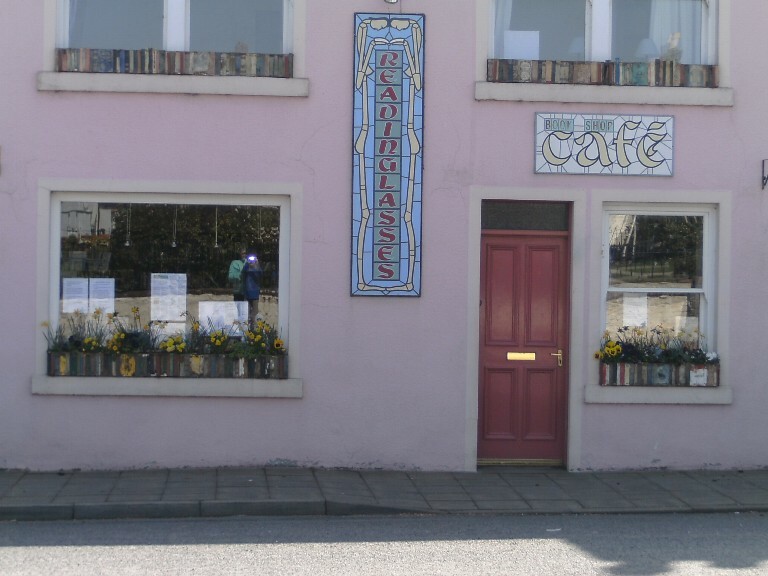 Has anyone else been to Wigtown? What did you think of it? Did we just catch it on an off week? Until next time, BookBoy out! 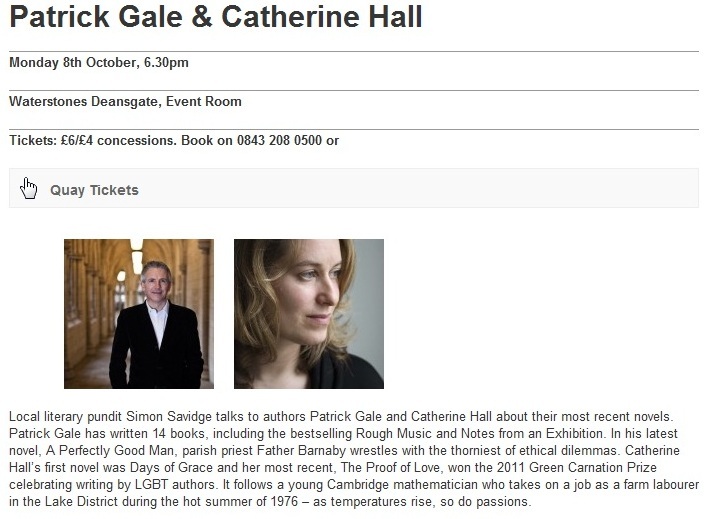 You might possibly have an inkling, can’t think why, that today is the day when the longlist for this years Man Booker Award is announced. 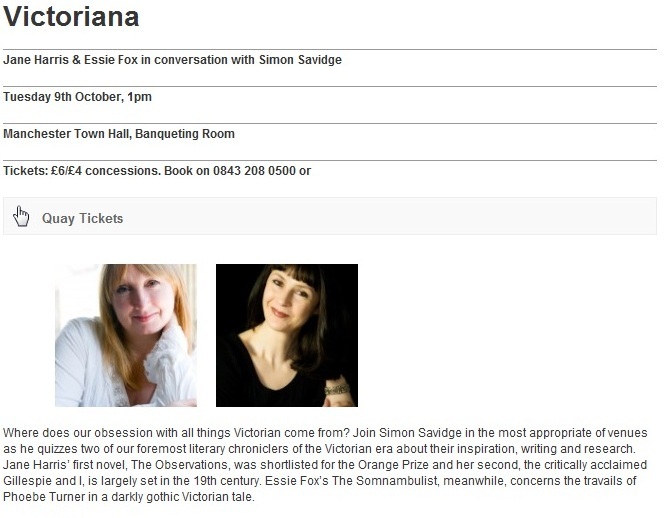 I have already had a crack at guessing just what books might make the list which you can have a peek at here. We all love a good list of books don’t we? Well, I do so I am assuming there must be more people like me? I really enjoy seeing people’s top ten or top forty books (which reminds me I need to add mine back onto the blog) and thought that today I would share with you my mother’s top ten books as she is a voracious reader and always has been, but more on her in her ‘Grilling’ later in the week. I said it would be my Mum’s top ten books which she claimed would be ‘really easy’ however after a few minutes I got the look and a slight moan of ‘ooh its really difficult’. There was also some excuse of needing to be ‘standing in front of all my shelves so I can think more clearly’ but soon enough we didn’t have ten books but twenty, and here they are for you delectation with some snippets of conversation that were sparked by them. War and Peace by Leo Tolstoy – which she read when on maternity leave before my sister (another book devourer) was born after which reading went out the window unless it was ‘Spot the Dog’. The Moonstone by Wilkie Collins – ‘much better than The Woman in White’ something we strongly disagree on. The L Shaped Room by Lynne Reid Banks – “I worry it has dated terribly by now so have never re-read, would rather have the memory of it being brilliant.” It’s just arrived at Savidge Reads HQ and I will be reading it soon. Wolf Brother by Michelle Paver – loves the series and got very excited when I said that Paver’s adult book is out in October. I was really surprised by this list and in particular the fact there was no Jane Austen, no Bronte’s and shock horror no Margaret Atwood. The latter seemed most bizarre as whenever I think of Atwood I think of my Mum. 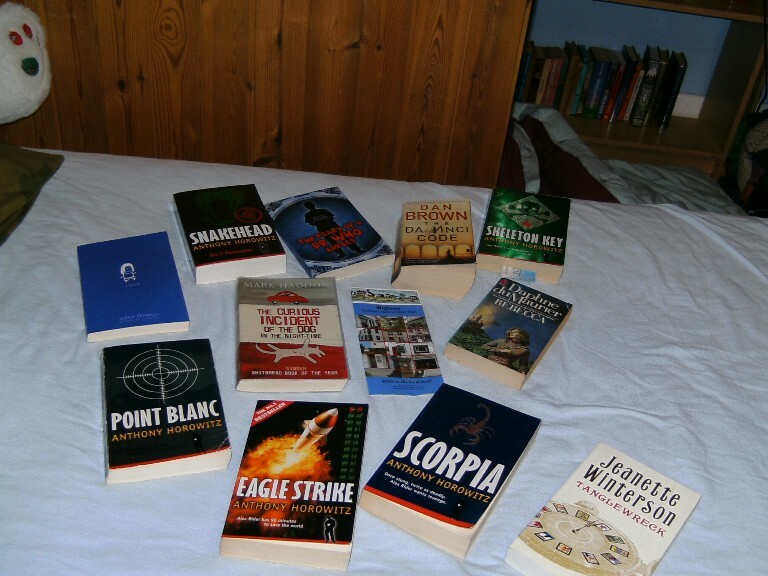 I asked her about these and she said “they are all great writers just no specific one book of there’s has made the top lot… you didn’t ask me for my top ten authors though did you?” I was also surprised no Shakespeare but apparently that’s because “you can’t choose one best Shakespeare play, it changes daily”. So there you have it, my mother’s favourite books, don’t forget her Grilling will be up on Thursday. Until then what do you think of her list, was it what you might have expected? Which books have you read and loved on the list? Could any of my mothers top books be found in your list of favourites?